It’s National Soup Day in Germany. Time to break out your best potato, cabbage or lentil soup, cozy up to a toasty fire and warm your bones. But of course, soup isn’t just appreciated in Germany. It’s a dish enjoyed all over the world in thousands of variations. And it has been a food staple in many ancient civilizations. In honor of Germany’s holiday we’re bringing you a recipe for hearty Kartoffelsuppe (German Potato Soup) and offering a brief ancient history of soup. So sit back, grab a spoon and enjoy! It would have been a very natural move for ancient cultures to rely on soup as a food staple. If you can only find a few ingredients to eat, it makes sense to boil these together into a more filling meal. Also, it would be easily digestible and a perfect dish for the weak or sick. 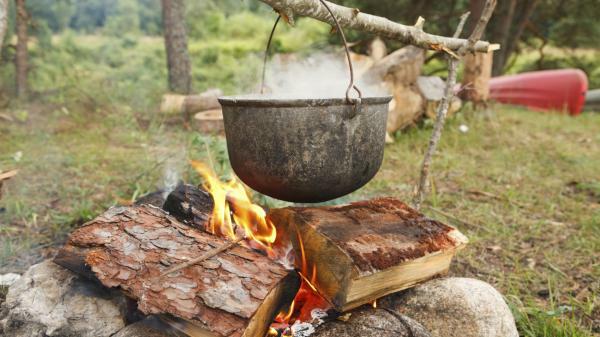 Another advantage of making soup is that the boiling often makes foods more edible. For example, acorns are typically bitter, but become tasty when boiled. The etymological idea underlying the word soup is that of soaking. It goes back to an unrecorded post-classical Latin verb suppare soak’, which was borrowed from the same prehistoric German root (sup-) as produced in English sup and supper. From it was derived the noun suppa, which passed into Old French as soupe. This meant both piece of bread soaked in liquid’ and, by extension, broth poured onto bread.’ It was the latter strand of the meaning that entered English in the seventeenth century. Until the arrival of the term soup, such food had been termed broth or pottage. Once soup really took hold around the world, it became the basis for entire restaurants and today is a cooking specialty in itself. To think it probably all started with boiling some bones in a pit in the ground! Slice carrots, celery and leek. Add above to salt water and bring to a slow boil in soup pot. Chop bacon into small pieces and fry in large skillet. Dice onion and sauté in skillet until browned. Add flour to skillet and mix thoroughly. Cook skillet mixture on medium heat for 2 minutes. Slowly add 1 cup of liquid from soup pot to skillet. Add skillet mixture to soup pot. Ladle soup into food processor or blender and puree. Add water if thinning is needed. Stone Age Stew? Soup Making May Be Older Than We’d Thought. (2013, February 11). Retrieved November 13, 2014. This entry was posted in Blog, Bon Appetit Wednesday, Culinary, Culture, Holidays, Public Life and tagged ancient history, ancient recipes, ancient soup, AntiquityNOW, Bon Appetit Wedensday, National Soup Day. Bookmark the permalink.